Ready for some spiritual rejuvenation? Imagine 4 days where you step fully away from the incessant to-do lists, the rushing to the next thing, the pushing forward on all engines. 4 days just for you… where you are so nourished that the tension and stress dissolve into a profound rejuvenation and enduring connection with your essence. In the Illuminate Your Being Meditation and Spiritual Practice Retreat everything is provided for you to sink deeply within yourself. It offers a perfect balance of meditation, gorgeous natural environment, personal reflection, enlivening breathwork and movement, soul-full community, and delicious, healthy food to restore an inner harmony and luminosity. 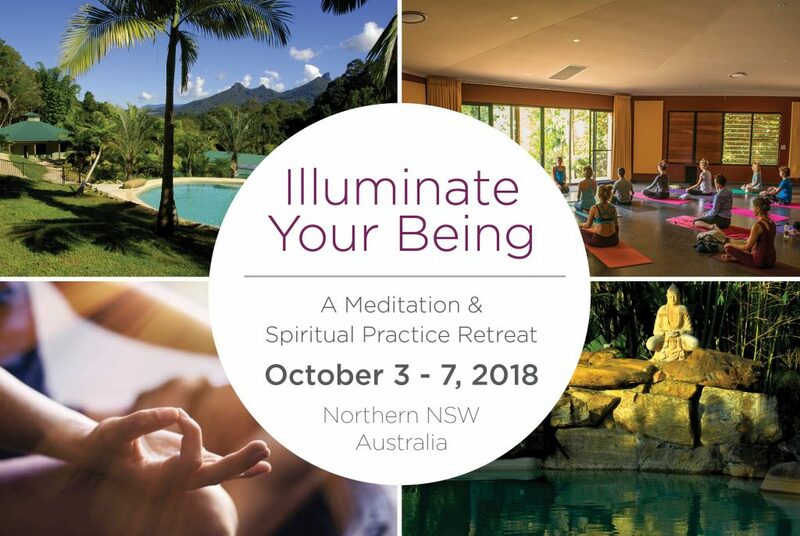 All of the spiritual practices you’ll experience throughout the retreat will help to clear away any mental, emotional or physical haze so that the light and life force within you can really shine. 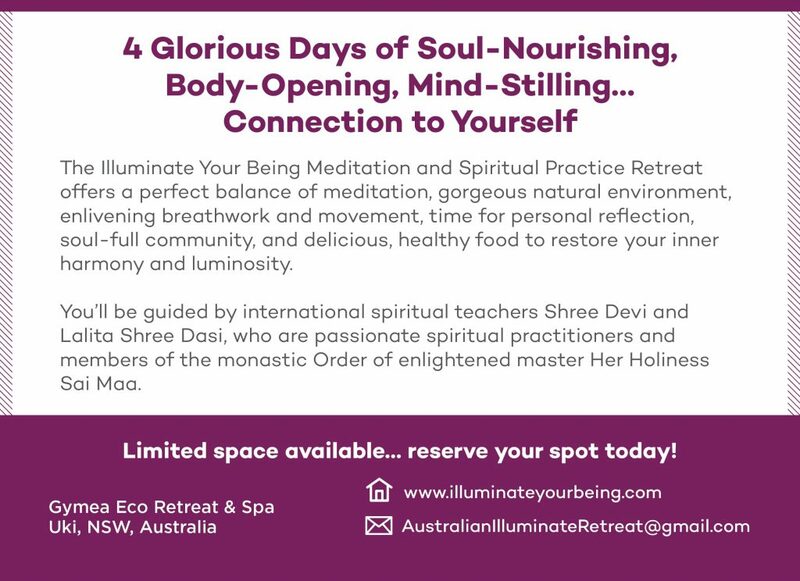 Shree Devi and Lalita Shree Dasi travel around the world leading workshops and retreats to bring people into deeper alignment with their essence and transform anything that stands in the way of its expression. As close disciples of enlightened master Her Holiness Sai Maa, they bring a wealth of spiritual knowledge and experience from their personal practices and from working with thousands of people over the last decade. They are both members of a monastic lineage, the Order of Sai Maa Brahmacharya, and have dedicated their lives to their spiritual practice and serving global enlightenment. The teachings they live and share bring together knowledge and practices from the Vedic tradition of India, esoteric self-mastery disciplines and transformational psychology. All of which they are committed to making easily accessible to your everyday life. The retreat tuition is $1450 (Australian dollars) for double room occupancy and $1625 for single room occupancy. A payment plan is available with registration prior to July 25. Not included in the retreat tuition is travel to the Gymea Retreat Centre, including airport shuttle, and any healing treatments at or use of Gymea Day Spa amenities. Limited capacity! As Gymea only has 20 rooms available, this retreat will fill up. We encourage you to register soon to hold your spot.